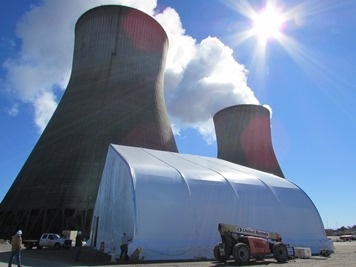 Last September, when unloading and inspection of Unit 1 refueling machine parts was hampered by bad weather, Mahaffey Fabric Structures was asked to provide a temporary structure for a nuclear plant project in Georgia. Although the project's current delays didn't impact critical path, having a tent on site would greatly help the plant to expedite this portion of the project for the Unit 2 installation. With the realization that a temporary tent was required, the plant turned to Mahaffey Fabric Structures, the nation's most trusted tent experts and leading providers of temporary structures and shelter solutions, to deliver a solution that would provide a dry area to unload four trailers delivering refueling machine parts. Materials are then inspected and reconfigured onto six trailers for transport into the Protected Area. This large, Mahaffey manufactured and installed tent, is now erected near the Unit 2 cooling tower, and will provide shelter for places of the new refueling machine. Nuclear cooling tower in the background of the Mahaffey structure with blue skies. Mahaffey's massive solution reached an impressive height of almost five stories tall. After assembly of the structure was complete by our experienced installation teams, the tent stood ready to remain in place until the end of the outage. The tent is designed to withstand winds of up to 130 miles per hour, as per site specifications. Tent is made up of aluminimum framing covered by vinyl. It's anchored by 17 concrete blocks called piers that weigh 4,200 pounds each. Each pier is secured to the ground with 10 metal spikes extending 3 feet deep. The tent is equipped with its own amenities, including lighting systems, generators, heaters and exhaust system. 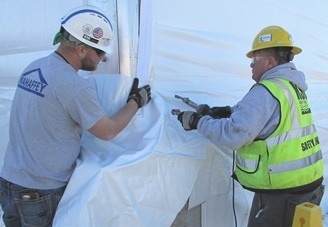 Zack Coats (left) and Wade Parsall (right), installers of Mahaffey, heat-seal opening in the vinyl tent to block wind and make it as airtight as possible. The addition of the Mahaffey manufactured and installed tent was just one of many lessons learned in the Unit 1 RFM project that are now being implemeneted for Unit 2. Mahaffey’s quick response and willingness to work in such a challenging environment are what gave the customer the confidence that Mahaffey would provide the best possible solution for their project's needs. 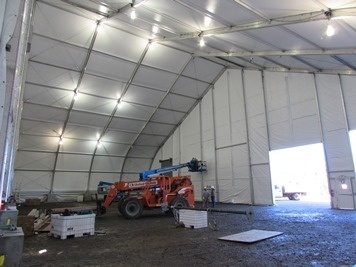 Inside view of the enormous tent as it shelters refueling machine parts. Are you searching for a temporary solution to speed up your project, or have some questions about our services? Please share this post with other looking for examples on temporary solutions and quick turnarounds to erect at their job site. You can even read our previous post on a Gulf Coast Procurement Project and go through the Resource Library.